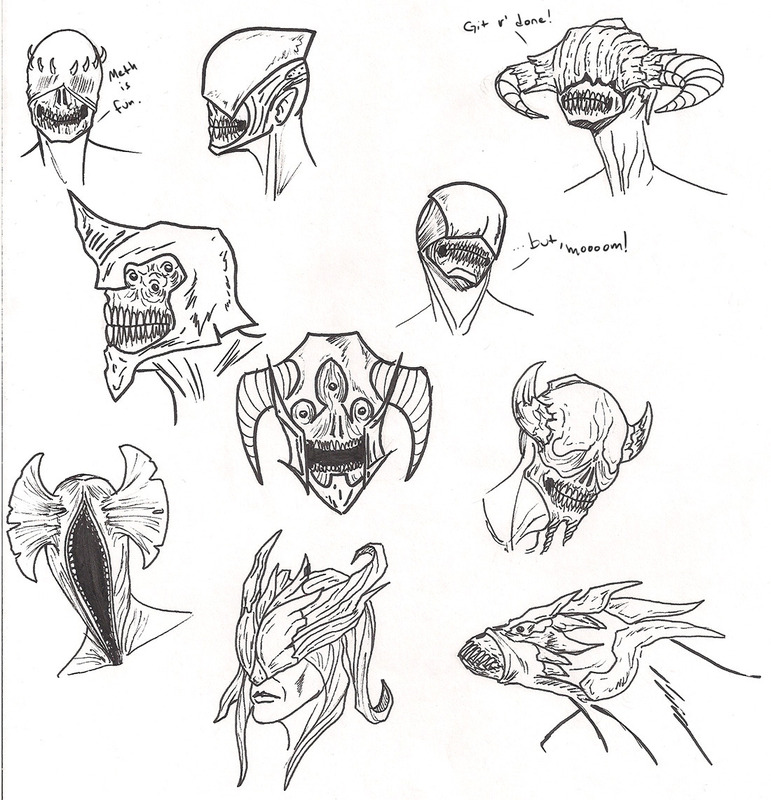 Random mostly-humanoid demon heads, because why not. Are we talking about the new Doom? I haven't played it, but I did play the original Doom, haha. I have a thing for humanoid-looking creatures with some slight body horror. The eyeless thing works wonder. I'm also a fan of bared teeth, if ya couldn't tell, haha. Ast, I am really glad you like what I have so far. It makes me very happy. I did write all that by myself, and I have you and Lamb in particular to thank for it. Remember when we did the hunters contest and you told me I needed to work on my storytelling? Then last year, I 'started' my comic, and it got torn to pieces by Lamb. I've since been working on storytelling and where I want to go with it, and I think it's finally starting to come together. It feels like I have a stronger sense of direction. It's a mish-mash of all the different things I like. I still don't consider myself a writer, so we'll see what happens. I love world-building, though, so I have a lot of that thought up. Now I just gotta work on the art aspect of it and maybe I can make it more appealing! I expect some harsh critiquing when I get the proper pages done. Yeah the new Doom, haven't played it either just watched at YT. I think I've seen concepts for it that kinda looked like your stuff there. 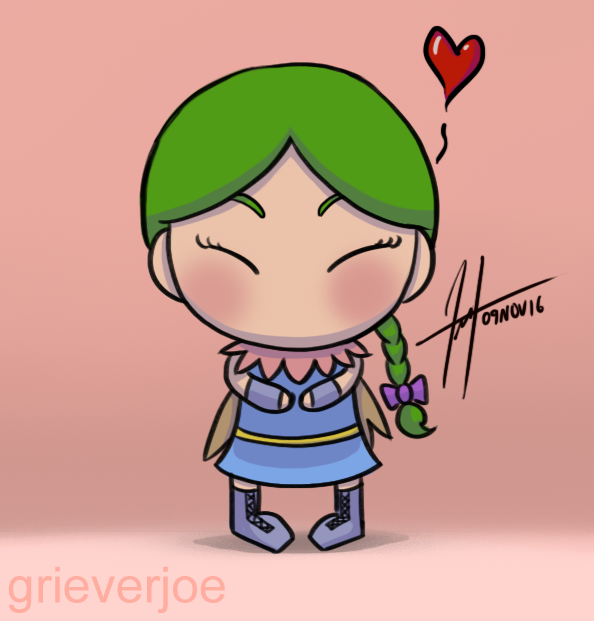 I have a thing for humanoid-looking creatures with some slight body horror. Holy hell. That story is good! The story and the visual representation make it feel like an old myth. Wow. Oh yeah, for sure. 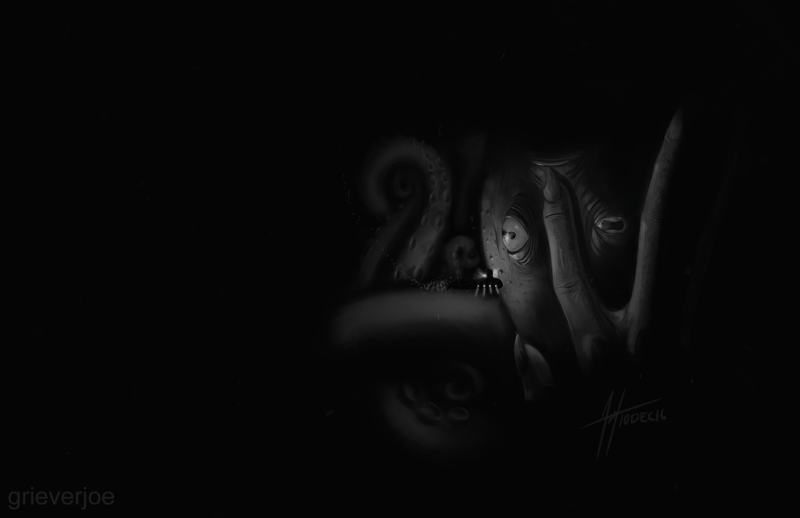 Carpenter and Lovecraft are two big sources of inspiration when it comes to horror design. Thanks, dude. See above for what I told Ast. This is, in part, your doing! "This is not dead that can eternal lie." Most of us are heathens in the innermost recesses of our hearts. 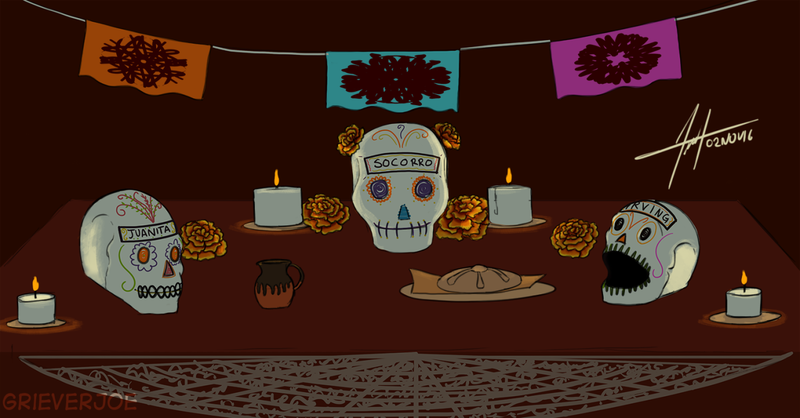 Quick, fun sketch for Dia de Muertos, of three of my family members. Really nice progress Action reads clearly. Now the main problem is that there is so much empty space in the action scene, but the empty spaces make it look really calm and tranquil when it shouldn't be. horizontals and vertical lines also impart a really calm feeling. You could experiment with some more dramatic angles, upshots and downshots with a vertical vanishing point to avoid these calm horizontals and verticals, even tilt the horizon a little You are improving nicely though. looking forward to more. Awesome, I'm glad the action reads well. And you know what, I just remembered what you said about the verticals and horizontals. D'oh! I'm gonna work on that on the next page. Thumbnails for future reference! Probably won't end up using 3; it doesn't have what I wanted. Nice thumbnails man! The leap in particular reads well. 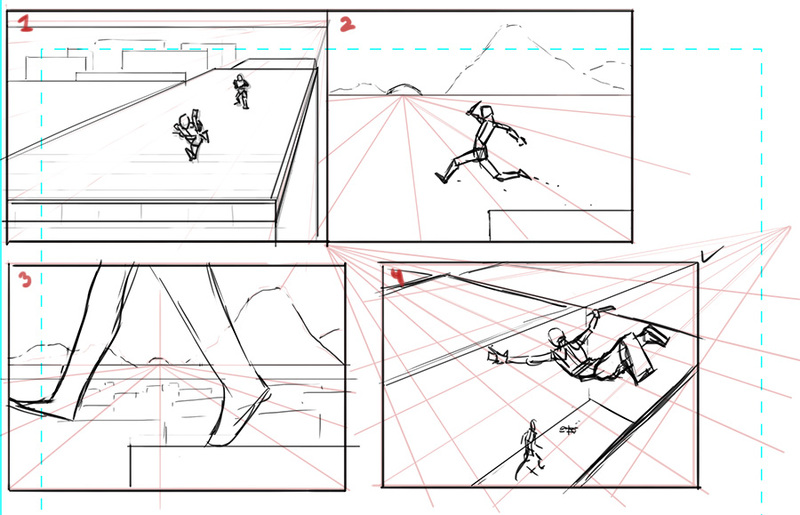 I like how clearly you set up the perspective grids. I think these all make for dynamic compositions, but I think when you finalize them you could try pushing the foreground more to increase the sense of depth. Thanks for that. When you say push the foreground more, do you mean push it farther back, or closer to the camera? 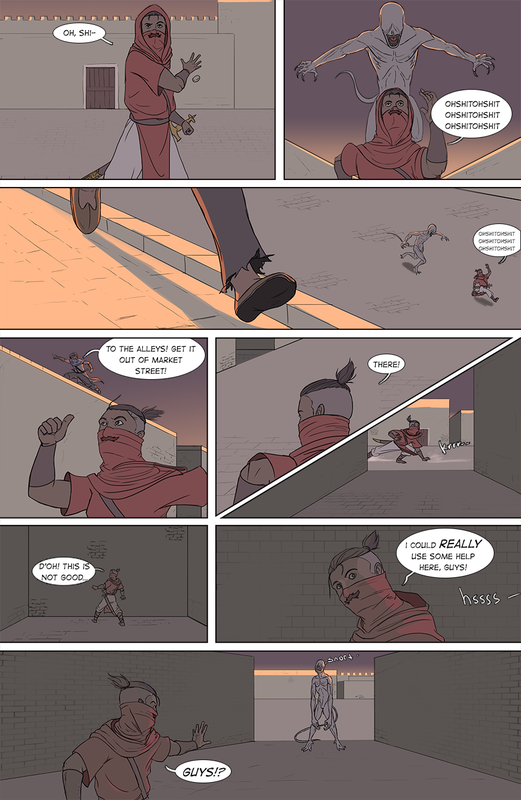 Also, do you guys think I should start a separate thread for the comic, or just keep updates on this one? Hmm... I wonder if you're not trying to squeeze too many panels into one page. Some of Frank Miller's stuff had this many panels, but a lot of them were super-stylized and/or essentially repeated panels, cutting down on work. Most books I see have around 5-7 bigger panels these days. I admit I haven't read comics in a looong time though. Also, I'd suggest adding some padding around the edge of the page, if only so you can bleed to the edge for dramatic effect when necessary. Re: separate thread: Up to you really. I kicked all of my sculpting / miniatures stuff to a separate (neglected) thread, because I felt it didn't even have the illusion of being competent work. But it might get even less commenting than the trickle we get these days. Hmm, that's a good point. I haven't read any comics lately, either, so I think I need to do some research, then, haha. I originally decided against padding because I thought it would give me even less space to work on the panels, but if I switch to fewer panels, then it might not be a problem after all. With all the comic work I've been doing lately, I wanted to do something a bit more painterly for a change. Inspired by Metallica's song, "Dream No More", and by Alex Konstad's "Hell of a Story"
It came out a lot darker when I saved it, not sure why. Sorry! 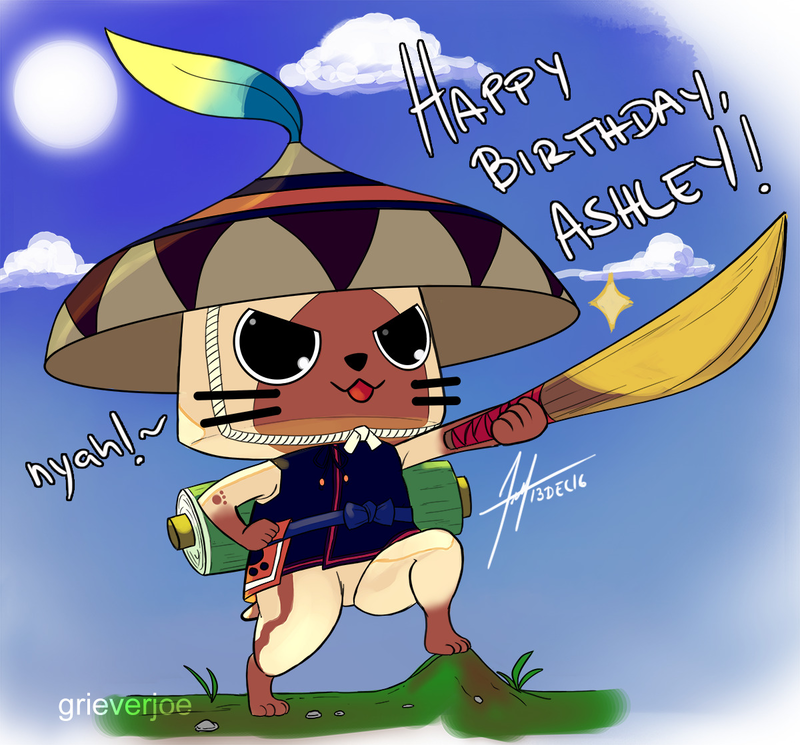 Monster Hunter Felyne done as a birthday gift for a friend. Photoshop CS6, about 3 hours.